Is tofu a safe food for my 1-year-old? Q: Is tofu a safe food for my 1-year-old? A: Tofu is safe for babies as young as 9 to 12 months old, provided it is part of a well-balanced diet. Critics of soy, a low-fat source of protein, overstate the potential drawbacks--severe allergies manifested in intestinal symptoms such as excess gas, bloating and diarrhea, and thyroid problems--and fail to note the benefits. The average American child's diet is too high in animal protein and saturated fat; eating tofu can help to change this. More study is needed before we can talk knowledgeably about any dangers. 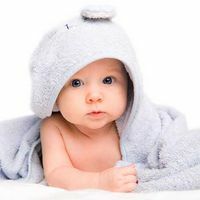 However, parents should consult their pediatrician before feeding a baby who's 6 months or older soy formula as some experts feel that its mineral balance is incorrect.